Having had some experience with finding US Design Patents (which are available online, and for free to boot), doing the same in the UK proved a tad more tricky. Things started off good, though: a kind and helpful lady at the British Intellectual Property Office helped me out with some advice, and, based on the few registration application numbers we had from Pippin Spacex cards (1), also found some listings in the Official Journal (Patents). These revealed the name of manufacturers McArthur Ltd, and that it was them instead of Triang who held the registration. Since the US Design Patents I'd found earlier had mostly been awarded to Rovex, this came as quite a surprise. Next I had to discover which volume of records contained the relevant documents at the National Archives in Kew (near London), and that's where I made a mistake. Used to the US document format, I initially ordered copies of the registration documents. These however don't include any images (and otherwise all look the same as the example shown below); the images being in separate "Representations" documents in a different set of records. The registration documents did contain details of the solicitors handling the applications at the time, who are still in business. Their oldest partner kindly checked their archives, in hopes of finding their copies of the applications that didn't get approved and therefore not included in the official records. But sadly he came back with a reply I'm unfortunately getting used to: it's too long ago, paper records take up too much room, plus McArthur Ltd had long ceased to be a client so nothing of their records remains. Meanwhile however, my good friend and co-conspirator Bill Bulloch had spent an enjoyable afternoon at his local IPO office, going through the OJ(P) and finding lots of new listings with their dates. Where it turned out that almost (2) all first-series Spacex toy designs had also been registered by McArthur Ltd (and wouldn't I love to know why McArthur had the designs registered instead of one of the Triang companies!). Due to circumstances it took me awhile to obtain copies of these documents, but listed below is everything there is. The first representation documents I had scanned by the National Archives were all for later Pippin-produced toys. A number of which had Bill, Paul Woods and myself pretty excited. Apart from three non-Spacex toys registered by McArthur (but brilliant to see nonetheless - they're also listed below), these included the representations of the pair of Soyuz craft and the photonic-powered Space Station. Which at that time were the only photographs we'd ever seen of these toys, only having known illustrations of them in some advertisements and no actual toys having surfaced yet. The range of numbers for the Stage One designs is consecutive, but has one number missing, 943302. This will have been for the Spacex Prospector, being the only missing toy, and indicates registration will have been applied for but not granted. Understandable, because Tai Hing had already registered the design of their larger version of this vehicle. When looked at more closely, a number of other surprises are found in the representation photographs of the later toys: differences in details or colours from the production versions, which I've noted with each document. Markings on stickers have been struck through by hand; presumably this was to not limit the design to a single name or to include such details. Moulded-in trademarks and Hong Kong markings have been removed or occasionally crossed out, while metal chassis for the later series are also shown in a version without any markings. 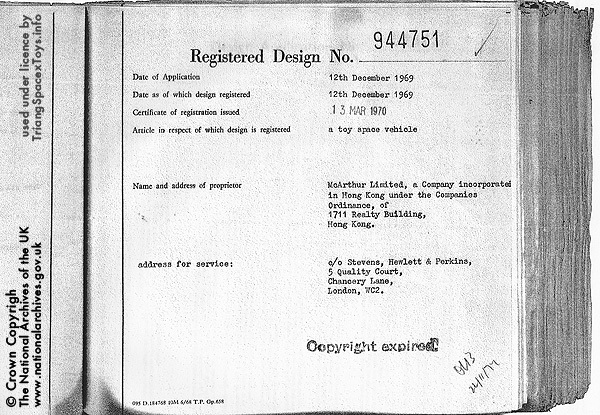 For some Stage One toys, these photographs do occasionally show whether a trademark was already present or not at the moment the documents were prepared. The difference in trademarks being present or not proves that these were only gradually introduced across the Stage 1 toys (inasmuch as a certain toy ever got one or not). And finally, the dates are also quite revealing. The Stage One vehicles were all submitted in one batch, a good year and a half after production had started (so the photographs show regular production toys), which will have been done to strengthen the argument in any infringement cases against copycat manufacturers. The registrations were also issued in one batch three months later. The later series' toys appear to have been submitted as soon as possible (with at least a pre-production model being available), a handful of applications being made every couple of weeks in December 1969 to February 1970. With the larger toys included, even though these were only introduced to the market a couple of months after the smaller toys. Approval could be fairly swift, the Nasa Glider/Lifting Body again taking three months. But f ex in the case of the Soyuz pair, it apparently took twice that long to conclude that these toys were a distinctive design that could be registered. The National Archives in the UK charge a flat licence fee per 20 documents. Since I need only 29 for Spacex, I can profit from this policy in showing another few Representation documents I ordered. Three are other designs by McArthur Ltd, which turned out not to be Spacex designs (the documents having vague titles like "Toy Vehicle" and such, there was no way of knowing beforehand). Two others are for Roxy designs of their copies of other toys, where I may still order another two-three which Bill Bulloch also found in the OJ(P). For these designs I didn't bother ordering the registration documents themselves, which all look similar to the one shown higher-up on this page. The ones for McArthur all have the same addresses. As to Roxy, I have their address at the time somewhere, so the only information missing are the details of the sollicitors handling their applications.